May 2014 Observations - Market Segmentation Among Smartphone Users Who Print? Would my next print job on an AirPrint MFP go best with a Cabernet or Merlot? Is an Android-enabled printer available somewhere near my bus route? Based on recent research, these could be the kinds of questions smartphone users are asking themselves, at least if we can put a few data points together. Once again, this month I take on a happy confluence of several of my favorite topics from somewhat far-flung tributaries of thought. One of those interests is the general field of marketing segmentation and advertising, another is my fascination with the world of mobile devices and the state of mobile printing, and the third relates to the overall quantification of things and how important it is to track the numbers, especially over time. Earlier this month, I noticed several stories that referred to a study on the contrasting characteristics between users of Apple iPhones (which all use iOS) and Google/Android-based smartphones. As Ina Fried’s Re/code story (“Android Users Are More Likely to Take the Bus, While the Frequent Fliers Choose iPhones”) summarizes, Battery Ventures did research on user activities and characteristics that are most (and least) correlated with owning and using the two dominant smartphone operating systems of the day. As Fried’s report on the research indicates, the motivation for the study is market segmentation, leading to better deployment (i.e., ROI) of mobile ad dollars - in other words, what are the basic buying interests and characteristics that separate the users of each platform? And given that information, where should potential advertisers place should ads for their products and services with the goal of reaching the most likely buyers? As a part-time professor of marketing, I am fascinated by segmentation, and in fact subscribe to the idea that market segmentation is one of the most critical ideas in the whole discipline of marketing. Segmentation is on my short list of topics, in fact, that I stress to my MBA marketing students, threatening to not let them out the door of my classroom until they can recite a few segmentation basics. For example, whenever someone hears “no one will buy this” or “everyone is going to love that,” I contend that they need to immediately reject those statements, knowing that segmentation precludes such universal judgments. So when Battery Ventures’ research of smartphones users finds iPhone users are more likely to be wine drinkers, and Nexus users are more likely to be beer drinkers, this is a useful metric, but like other points about segmentation, it is neither a value judgment nor a statement of causation (despite the correlation). I refer readers to the Re/code and Business Insider articles for more “fun facts” about the two camps gleaned from Battery’s research, and especially take in some of the reader comments, and how strong some peoples’ reactions are to this perceived “stereotyping” that really isn’t that at all, but still seems to raise both ire and suspicion. 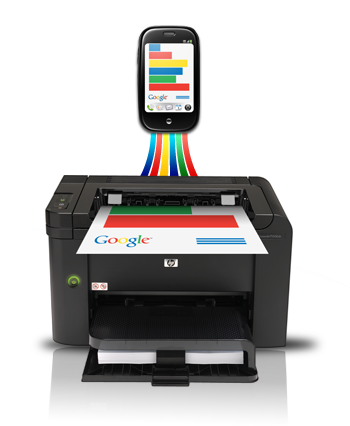 At a recent HP Industry Analyst event, I had a conversation about mobile printing and its users with none other than Dion Weisler, senior vice president and head of HP’s PC and Printer Organization. He indicated, without spilling all the beans, that a large difference existed in printing behavior when it came to the two platforms. In thinking about this more, and then following up with others, it made sense more printing would come from the more active iPhone users. These data are just a start, and between numbers provided by HP and other vendors, and those available on the websites of such printing-oriented pages as those from Apple and Mopria, a regular "Harper’s Index" could be generated. And speaking of that, stay tuned for June’s Observations! Slightly before the close of the markets yesterday, May 22nd, HP announced its quarterly earnings. Layoffs of from 11,000 to 16,000 more workers dominated the headlines, as well as much of the conference call discussion, but as of mid-day the 23rd, HPQ stock is at 52-week highs, near $34 a share. On the revenues side, there were many single-digit-negative entries, is typically of recent performance. The -4% year-over-year quarterly drop was the 12th negative number in a row, making it three full years of declines. The "bad news" is pretty evenly spread out, as is typically. CEO Meg Whitman did offer some "color" on IPG results in the Q&A, and her comments are worth reviewing via transcript at the company's investor relations site. Like the numbers themselves, the blame (and some might say excuses, e.g. "...our managed print services business, we were late to that market and we're catching up fast...") is also spread around nicely. It's a small world - Imaging Channel's Top 3 Blog Posts look familiar! Checking in Monday morning on what was new in the world, it was great to see a new blog post from Memjet's Kim Beswick, entitled "Speed: An Experience, Not A Spec" on The Imaging Channel website. 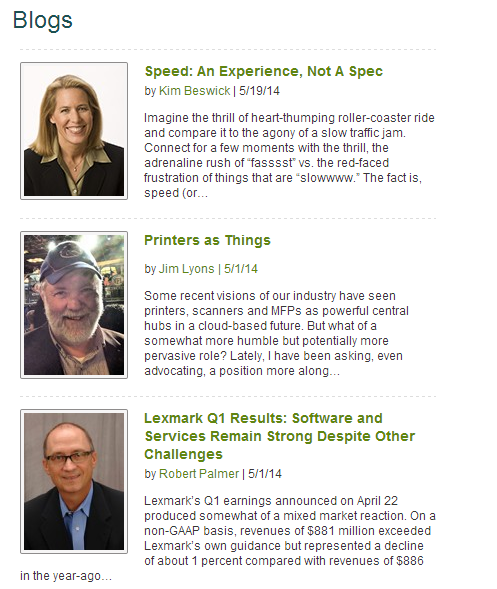 Scrolling down "beneath the fold", I then found the three featured posts (see screenshot below), also including mine on "Printers as Things", and Robert Palmer's on "Lexmark Q1 Results." It's a small world, indeed! 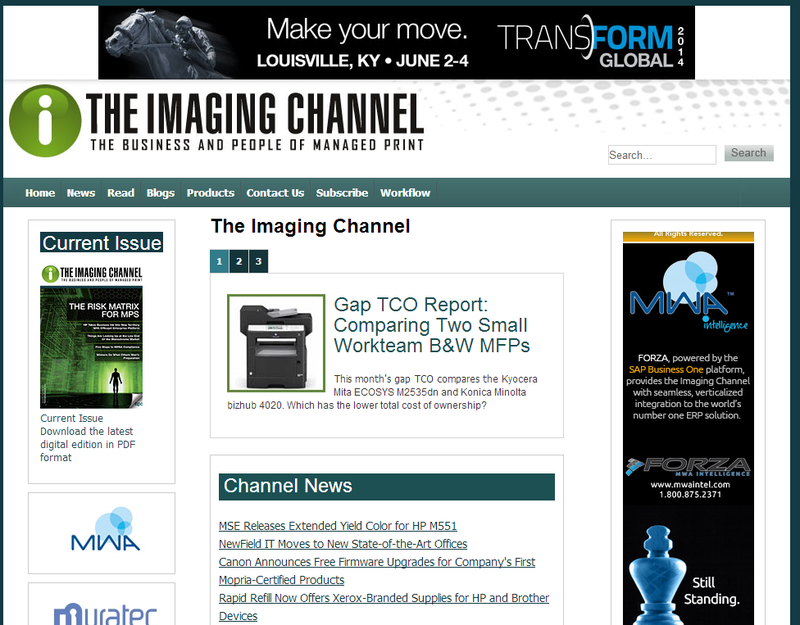 It's an honor and privilege being featured on the Imaging Channel' front page for blogs by two long-time friends!